On April, 27 GlobeCore received the guests from Turkey. The representatives of Andritz Hydro LTD. STI and the representatives of General Directorate of State Hydraulic Works, Dams and HEPP Department came to the GlobeCore facilities to test the CMM-8.0 unit. It should be noted that General Directorate of State Hydraulic Works is the main executive body of Turkey, responsible for development, planning, regulation and servicing of natural resources. The main priority areas of activity include project management, construction and servicing of hydroelectric power stations. Hydro turbines are considered to be the main part of the hydroelectric stations that bring into action generators that produce electric power. Turbine oil is used to lubricate bearings and reduction gears of turbines. During servicing, oil is affected by gasses, gaseous products and water that leads to oil’s aging. As a result, oil loses its anticorrosion, antioxidant, antiwear and anti-foam properties. It is therefore, old turbine oil should be replaced or restored to its original condition. The second variant is cheaper since there are no expenditures on new oil purchase and disposing of waste oil. The GlobeCore CMM-8.0 is designed for degassing, dehydration and filtration of turbine oils that allows for its service life extension and costs reduction. The Turkish delegation was present during the equipment testing. The obtained results have shown the readiness of the CMM-8.0 unit to solve the tasks. 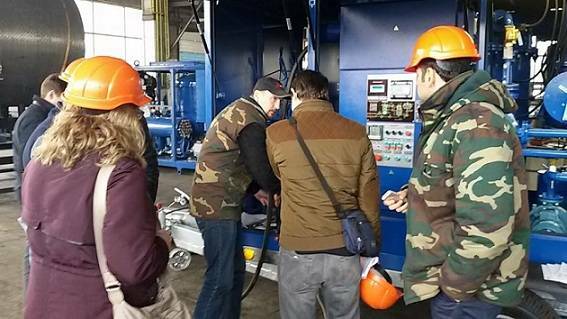 The employee of Andritz Hydro LTD. STI Irsad Akaydin has shared with us his impressions about the visit: ”We have arrived at the GlobeCore production facilities to test the equipment. Everything was great. I haven’t heard about GlobeCore technology before, that’s why we gained great experience visiting this company. We are also very happy to have visited production shops and got acquainted with the peculiarities of the works carried out”.